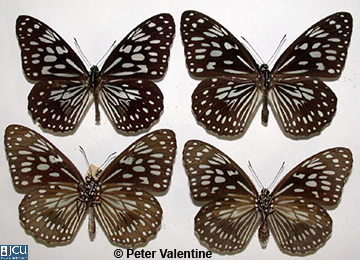 This common Townsville butterfly feeds on vines in the Asclepiadaceae (Apocynaceae s.lat.). Mature larvae greenish-blue to white with a broad orange band plus some black bands enclosing white bands; head black with two curved bands. Adults black with numerous hyaline blue streaks and elongated spots; lower surface similar to upper but paler.